Adam and I were pretty damn excited when we realised we could purchase Bento for our Shinkansen trip to Kyoto. 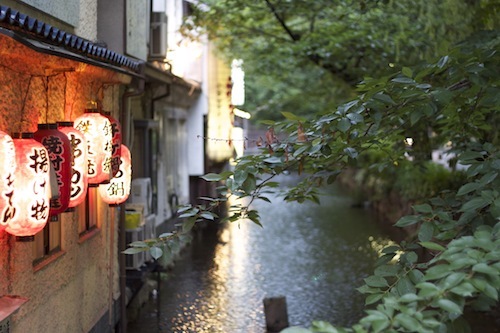 We had to say goodbye to our beloved Tokyo, but it was easier to make the break with a couple of authentic Japanese lunches under our wing, and a comfortable Shinkansen ride ahead of us. Trying to pick which one was a challenge, we did our best matching the pictures to the boxes and confirmed it with some assistance from a friendly local. We also couldn't help but throw in some of our favourite koala choc-filled biscuit treats. The Shinkansen was already our new favourite way to travel - throw in bento and biscuits and you can't get much better than this! One of my 2012 resolutions was to make cute character bento. Bento is basically Japanese for a take-away style or home-packed lunch. I guess you could liken it to an Aussie lunch box, but with a lot more personality. Whilst exploring stores in Tokyo, I did manage to pick up some more bento supplies to add to my already awesome collection. I am still yet to make a bento myself though... I really must get on that. But, back to our Shinkansen trip! I picked a pork bento. Mine was delicious, but would have been better served hot. I had definite food envy of Adam's selection, as he chose chicken and it was simple, classic and perfect cold. And he had an umeboshi. That little pinky coloured thing in the middle of his rice. It's a classic Japanese salt plum, that we had seen in multiple anime (cartoons). It is extremely sour and salty, and Lisa (who lived in Japan for a time) tells me it gets the same sort of negative reaction from foreigners, as a vegemite sandwich does. Adam bucked that trend, and loved it. We must work out if we can source them from our local Asian grocer! It took a lot of restraint from this self-confessed hoarder not to keep the funky mock-timber boxes. But I took a deep breath and let them go. 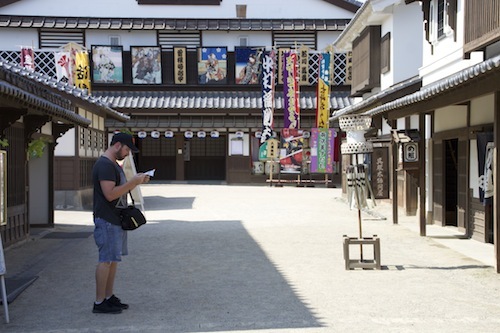 For our Kyoto accommodation, Adam carefully selected a bed and breakfast. 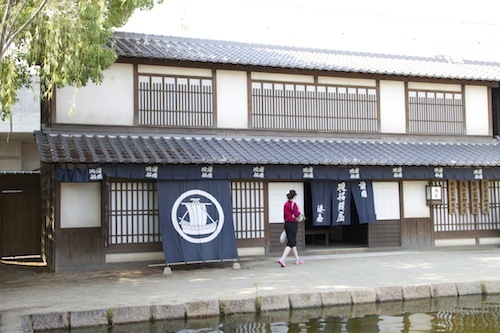 Yonbanchi is a traditional Japanese home that dates back to the Edo period (1603-1867). 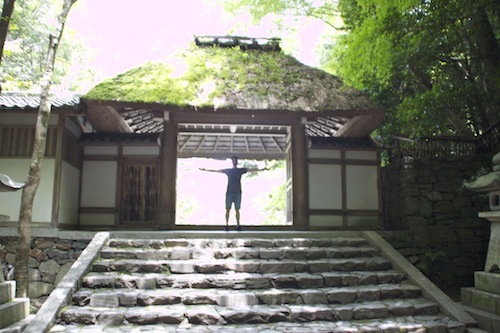 Originally the home of a samurai who was in charge of a nearby temple, it is now owned by a French gentleman and his lovely Japanese wife. We were picked up by Divyam, who was rather tall and in a teeny-tiny car. We ourselves and our bags into said miniature car and were taken to our new home. We were stoked with our choice. 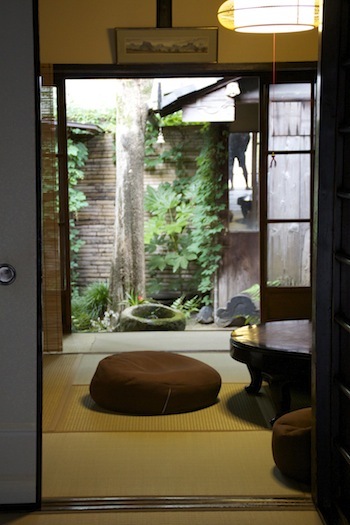 It was a proper Japanese home - shoes off at the door, tatami mats throughout, paper walls, and floor futons for us to sleep on. 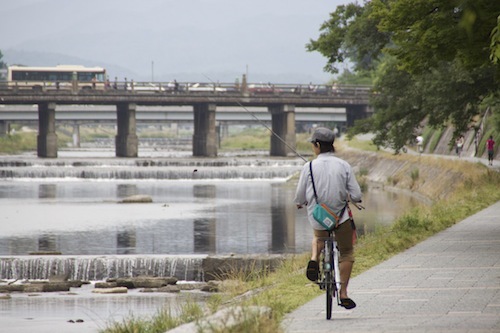 Divyam was exceptionally helpful, and before we knew it, we had hired some push bikes and a map, and were off to explore Kyoto. 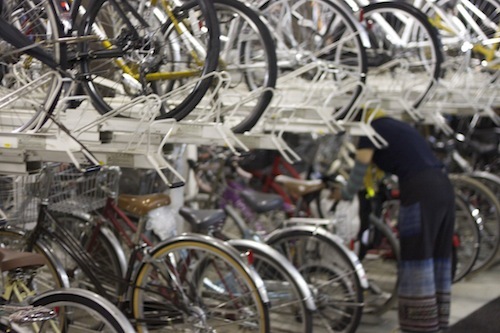 They are really strict on where you can and can't park your bike in Kyoto. Being that we are such a pair of goody-two-shoes, we weren't keen to park them just anywhere and asked the local policeman to direct us to the nearest bike parking lot. Fully equipped with security gates, and racks for hundred of bikes, this is like bike parking in Australia. 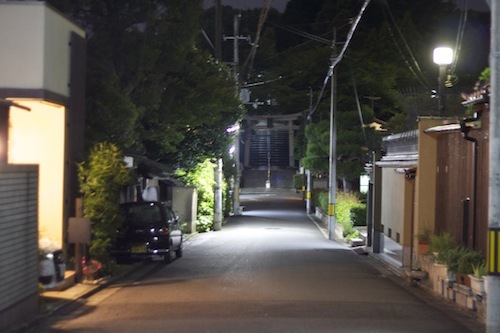 We then proceeded to explore the streets on foot. Stopped for dinner and had a fantastic chat with the chef. I'm surprised we didn't take more photos of the food. It was crazy-good. 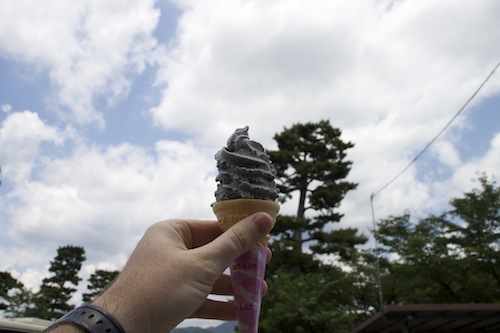 And they even had black sesame ice-cream on the menu. It is a favourite of mine and Adam's from when we used to frequent Wagamama in Brisbane. We were so enamoured with the food that we completely forgot to order dessert, so made sure to visit again a few days later. One more thing that we had hoped to find in Japan, that we had heard about from people who had travelled there before us - was the existence of wacky vending machines. We are talking about things as insane as a live lobster skill-tester, and a sheer abundance of beer vending machines. 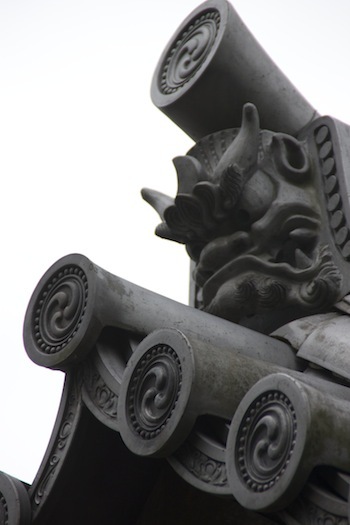 But, just like the Harajuku teens on the Jingu bridge, these crazy machines were something that had been evading us. And just the same as the kids on the bridge, we found out that, unfortunately for us - the time had passed. The alcoholic beverage vending machines were being removed from existence to counteract a growing underage drinking problem. We didn't find any in Osaka or Tokyo. We were too late. 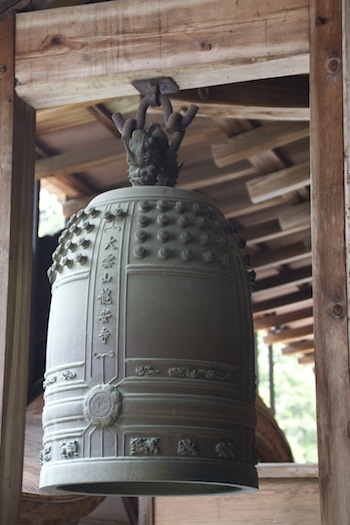 And then, hidden in a back alley of Kyoto, Adam spied this glorious sight. Evidence of a time once past. 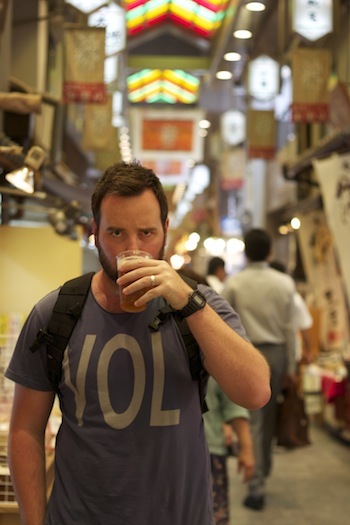 He of course got himself a beer and we then proceeded to ride around Kyoto, had our first and only onsen experience (Japanese public bath houses), and continued exploring Kyoto's pure awesome-ness and old-time beauty until well past midnight. I am so glad that Adam has a sense of direction, because mine is terribly lacking. I'd like to be awesome and prove the 'women-can't-operate-a-map' stereotype wrong... but I really am terrible. 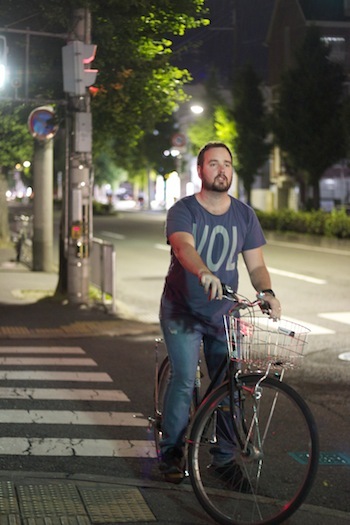 My GPS is my loyal companion, and in Japan I didn't have one. Thankfully, I did have a very capable husband. 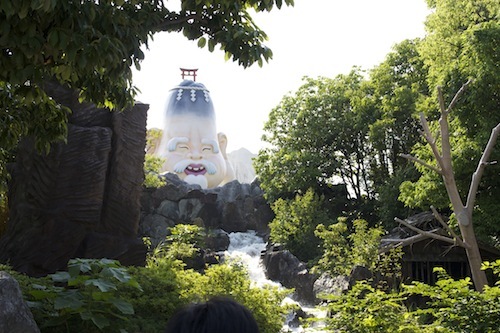 I was happy to give Adam the control, because we would never have found our way back to Yonbanchi with me at the helm. Over a delicious breakfast, Divyam gave us some fantastic pointers as to which temples and shrines to see for the day. Our plan - lots of exploring. 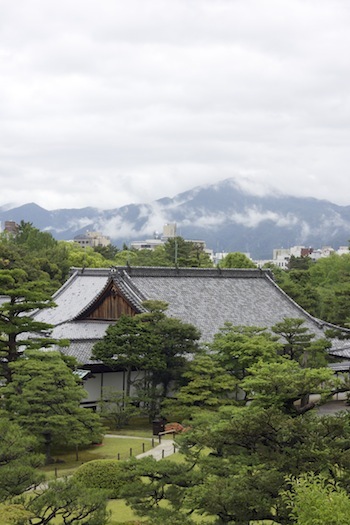 I know a few people who are very well travelled, whose most favourite place in the world is Kyoto. My understanding is that during World War II it was spared from the bombings, largely due to its beauty and history. 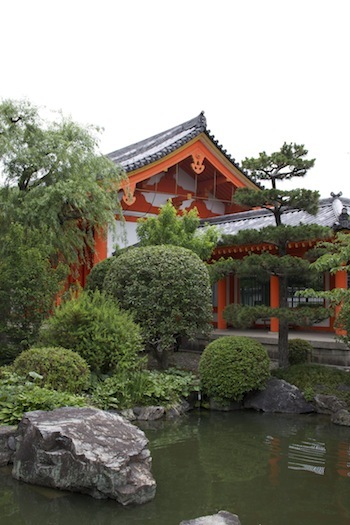 There is an absolute abundance of temples, shrines and gardens to see in Kyoto. I was just told by one of my darling brothers to be more discerning with choosing the photo's for my posts. I appreciate the criticism and he had a fair point, but I have to say I am finding it extremely hard to cull from the almost 10 000 photo's that we took during our Japan trip. My apologies that these posts have not only taken so long to be done (6 months is not that long right?! ), are so photo heavy and also that they are so long in length. The truth is, I'm using this like my diary. My memory is beyond terrible and it is important to me that I have this to remember our belated honeymoon by. Ideally, I would have loved to post each days escapades as they happened, but who has that time available whilst on holiday? It's very easy for digital photo's to end up in the abyss that is my computers hard-drive. As I said just a moment ago, my memory is terrible. 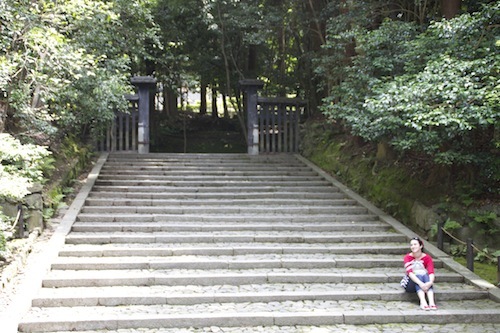 So the names of the shrines and temples we visited are long gone from the realms of my mind. I could trawl the internet and match our photo's to locations, but at the moment I don't really have the time... and when it all comes down to it - it is the experiences I desperately don't want to forget. 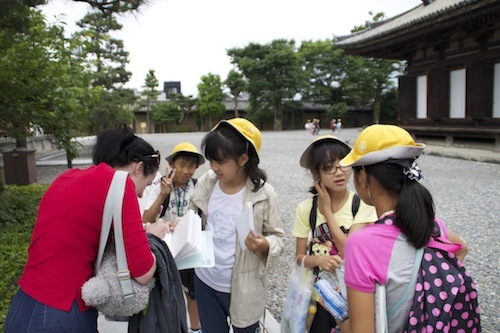 Like talking to the Japanese school students who were also sight-seeing. 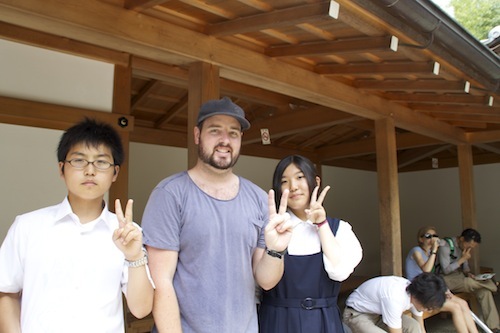 They had beautiful manners and would ask us politely if they could speak English to us as part of their studies. It would often mean us answering a series of questions, a photo with them as proof that they had spoken to us, and us signing their school books. Some of them even gave origami as gifts for helping them. I felt like a bit of a superstar, being hounded for photo's and an autograph. The kids loved Adam. He scored multiple origami flowers. 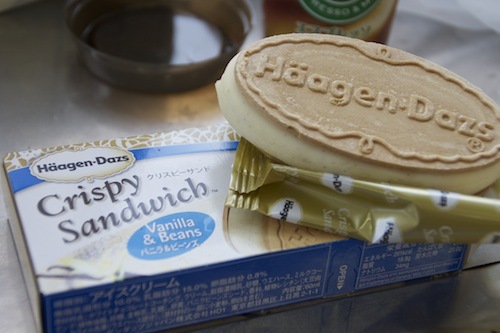 Or chowing down on Haagen Dazs Vanilla & Beans ice-cream sandwiches. So simple. So scrumptious. Quality vanilla ice-cream inside a white chocolate and vanilla bean shell, with a light wafer-like biscuit layer on either side. Adam and I frequently spoiled ourselves with these delectable treats. Making a dessert based on them, has now been added to my rather extensive list of things to do. If only I could locate the real thing here in the Land of Oz. And I especially don't want to forget our late dinner prepared by this crazy chef, who stopped cooking to play his guitar to us and tell us rather animated stories about how much money he lost at Conrad Jupiters and how 'Robot' DeNiro opened a sushi restaurant. We even have audio buried somewhere in the depths of Adams computer of us all singing Frank Sinatra's My Way together. It was a definitive night for us as a couple and something we will cherish forever. 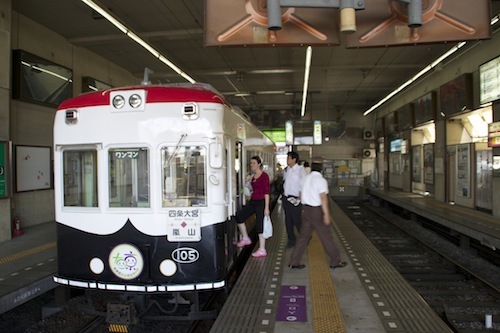 Today we boarded a tram bound for Arashiyama. 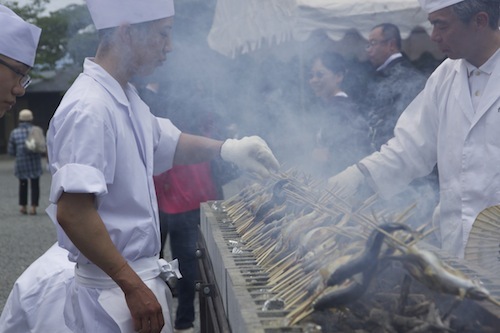 On our arrival, we walked over the bridge to find an awesome fish BBQ feast being prepared. Adam got all psyched up and ready to get himself a fish on a stick, only to find out that it was part of a pre-arranged tour group. It turns out, money cannot buy knives fish-on-sticks. Whilst disappointed with the inability to purchase said fish, we did strike it lucky and found a small stand that served black sesame soft serve. 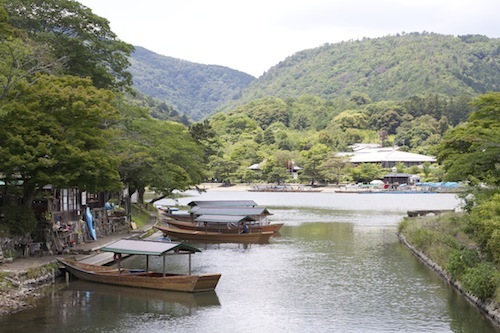 Divyam had given us a bunch of suggestions of what we could do in Arashiyama. 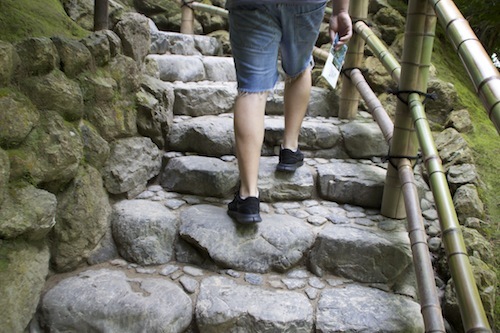 We had big plans of what we should see and do for the day - like walking through the famous bamboo forest, going to a monkey park and taking a romantic row-boat ride together on the river. It was a beautiful area, and it would have been lovely to have my strong husband with his muscular man arms rowing me around the river like I was a lady of leisure... but the reality is - it was a stinking hot day. We could foresee that with my current skin shade of pasty almost see-through white, I wouldn't last long on the open water in full sun, and Adam would soon be a strong husband frustrated and covered in sweat. So after some deliberation (were we just being stingey and lazy? ), in the end we opted out of the romantic river row-boat ride for two. Instead we sat at a little old ladies beverage and snack stall, in the shade beside the river, enjoying the view and a cold beer together. We watched the people on the river struggle with the heat and the super strong pull in the water. In theory, it could have been great, in execution - well we had definitely made the right decision! We also opted out of the monkeys as we realised we had seen hundreds in the wild whilst staying the night in a Thailand rainforest, and we really didn't think you could get much better than that. 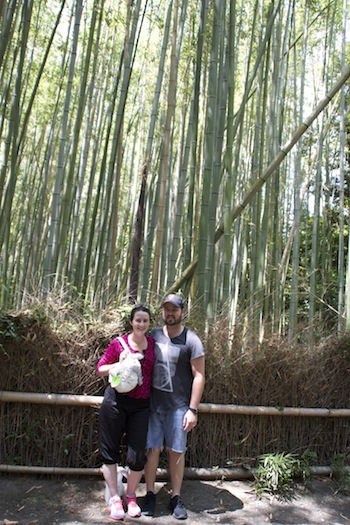 We did however, take a lovely stroll through the Bamboo Forest. On the tram, on the way to Arashiyama, Adam had spotted a sign for a Japanese film and tv theme park. 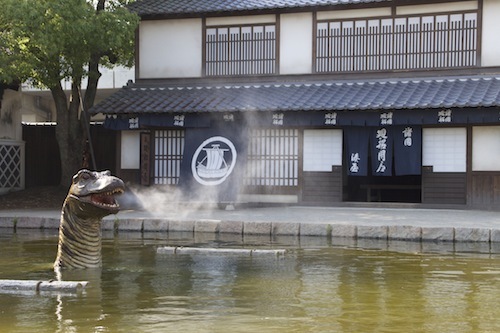 We figured this was right up our alley and decided to stray from our plans and visit the Toei Kyoto Studio Park. It was touristy, tacky and we loved it. It's basically a film set for movies and television drama's and a theme park all rolled into one. All the staff wander around in the park in period dress. 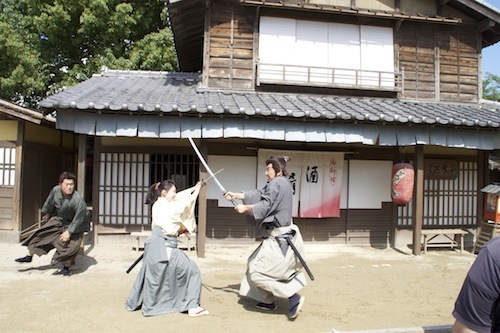 And there are pop-up live action demonstrations, as well as organised seated shows. ...only to have a dinosaur emerge from the water. ...only to have the mountain, turn into some strange old man's head. 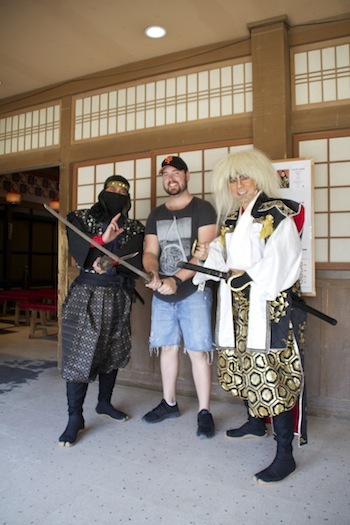 You can actually hire and wear samurai, ninja and geisha costumes for while you are walking around the park. We thought that could be heaps of fun, but we arrived too late in the afternoon to make it worthwhile. Adam did however get to purchase and throw real ninja stars into a wooden wall. That was one life dream fulfilled right there! 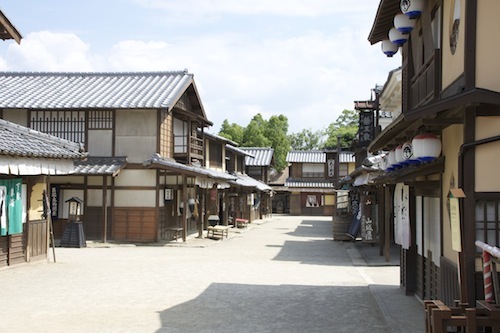 Another section of the Studio Park was more like a modern museum for Japanese film and tv. 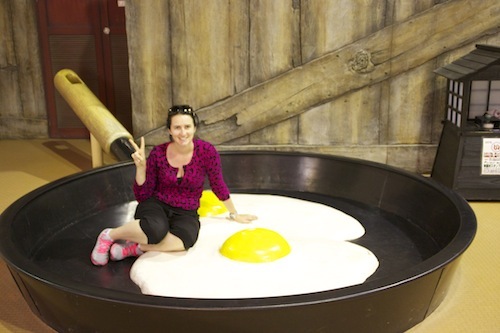 For some reason there was a giant frypan, so I quickly jumped into it and asked for a picture. 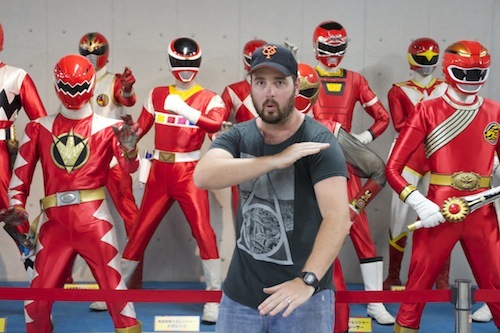 But the pièce de résistance was definitely the room with every Red Power Ranger costume in history! There was so many evolutions, that it was actually impossible to fit them all in one picture. 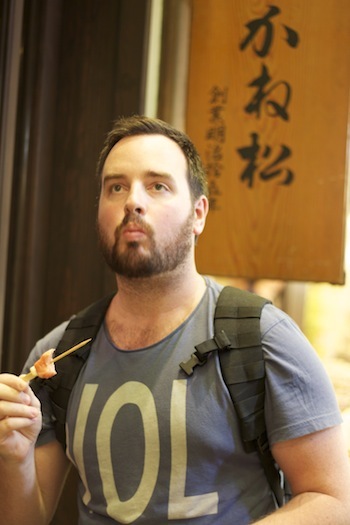 When checking out the gift shop, we took this photo of Adam to remember KungFu Dugong. We had tried to win this silly looking stuffed toy in multiple skill tester machines during our trip, but to no avail. We had hoped to add him to our 'one day we'll have a baby' box, and here he was for us to purchase outright. He wasn't cheap, and as the reason we had found ourselves in Japan was because we weren't pregnant, we took a photo to remember him by and put him back on the shelf. I did the same with a stuffed Dumbo at the Disney theme parks souvenir stores. This Dumbo was the perfect stuffed toy for a baby. Gorgeous and soft, with beautiful sad eyes he evoked memories of Dumbo being nursed and swayed in his mothers trunk. I carried him around the store, wanting so bad to have a reason to buy him... but in the end we decided not to torture ourselves and walked out empty-handed. 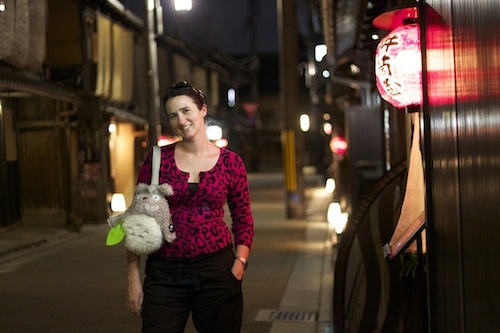 In complete contrast to the modern side of Kyoto that we explored that afternoon, that evening we ended up in the back streets of Gion. 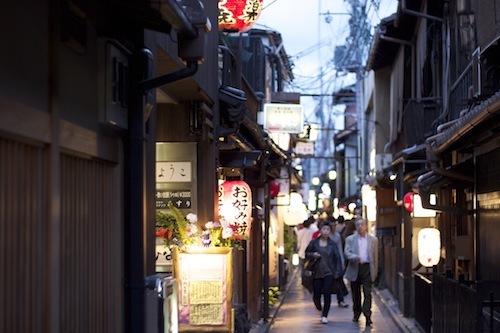 Gion is true, vintage Japan with beautiful old buildings, traditional teahouses and expensive restaurants. Some parts are still without electricity. 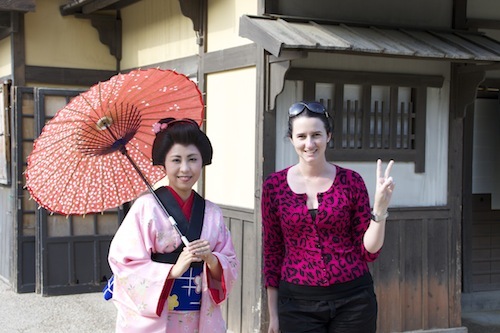 It is known to be one of the last places where actual Geisha still exist. Adam and I were wandering around the quiet back streets, playing with our camera when out darted two business men, one in a suit and one in traditional dress accompanied by a real-life Geisha. We didn't want to be disrespectful, so we put our camera away and tried not to stare. It was unexpected and very cool! 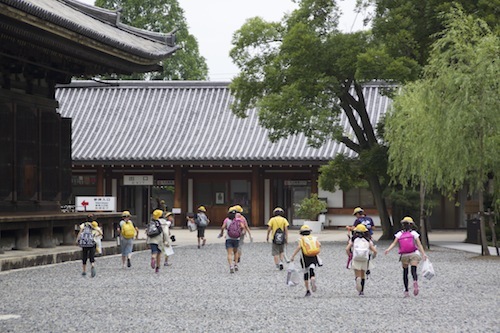 Not yet 'templed out', today we got ourselves a bus pass to visit Kinkaku-ji and Ryōan-ji. 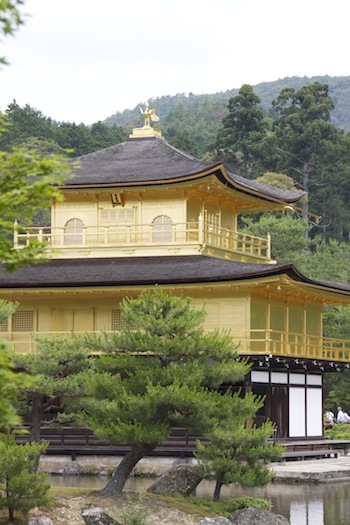 Kinkaku-ji is covered in pure gold leaf and is one of the most popular buildings in Japan. It was a mission struggling through the crowds of school children and sight see-ers, to get a good picture of the Golden Pavilion. 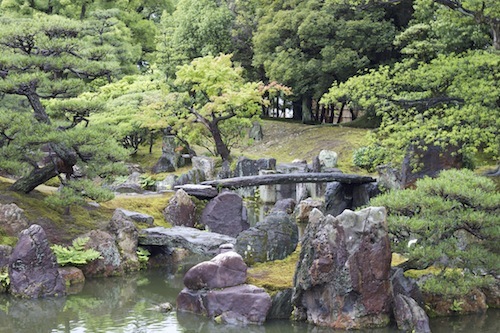 Ryōan-ji is the home of one of the oldest and finest examples of a traditional zen rock garden. 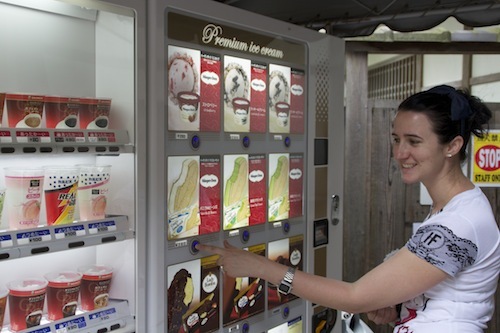 Nothing like a dessert before lunch, I couldn't help myself when I found a Haagen Dazs vending machine! 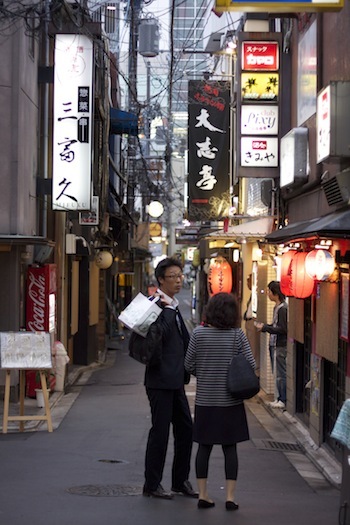 ... but I woke him up and we proceded to go shopping in Nishiki Market and its surroundings. 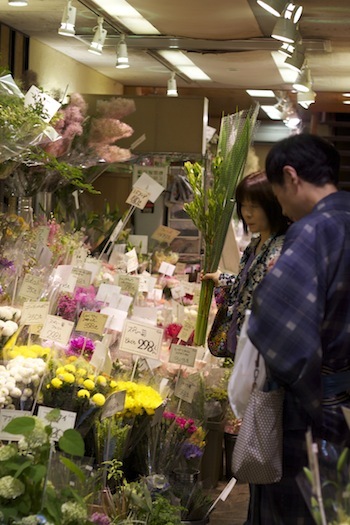 I spy with my little eye, a 100 YEN SHOP near by!!! I purchased a few more bento related goodies and proceeded onward to explore more. 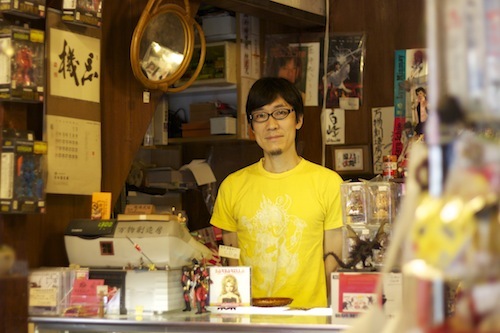 The above store is Aritsugu, and is somewhere my chef brother visited and purchased a knife when he travelled to Japan. 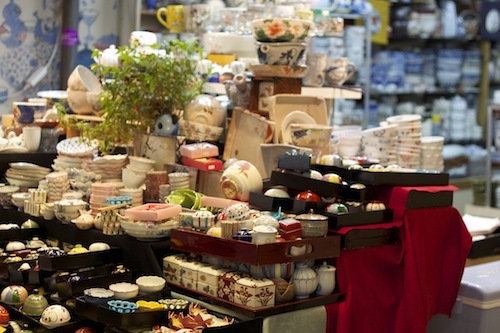 This store is a family business, handed down through multiple upon multiple generations. 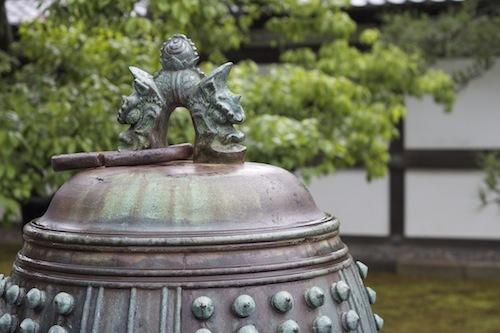 It originated in 1560, and started out making swords for the Imperial House of Japan. That's not a typo 1560 is correct! It has since adapted with the times, and now produces spectacular knives, and other impressive cooking utensils. 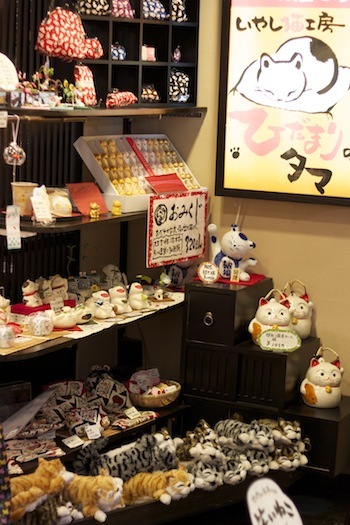 Adam was hoping to find an affordable, quirky sake set on our little shopping expedition. But they were either quirky and unaffordable, or affordable and not to Adam's taste. I on the other hand managed to refrain from purchasing anything in a store that was completely dedicated to all things cat related. Impressive restraint, no? 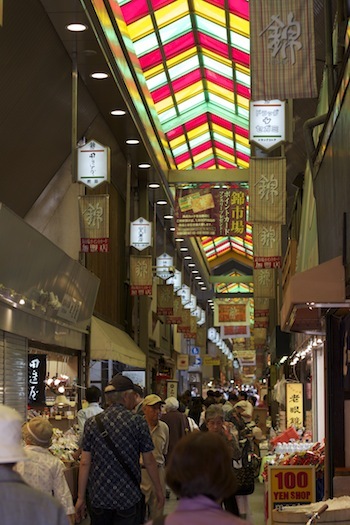 What we really enjoyed about Nishiki Market was checking out (and sometimes sampling) the local made food and beverage products. 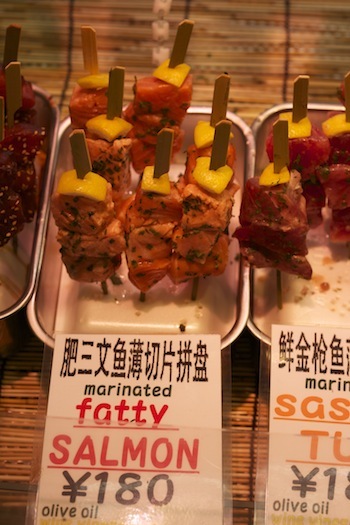 That fatty salmon was so heavenly that you could almost claim that an angel had in fact, died in your mouth. 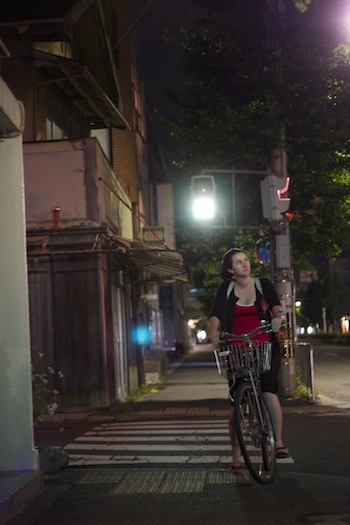 It was officially our last night in Kyoto, so we decided to do something silly and give in to karaoke. Karaoke is massively popular in Japan. See that sign for "Ichi-Karaoke" that's Karaoke for one person! These Karaoke franchises are everywhere. They have multiple booths, on multiple floors, of multiple buildings. Adam and I ummmed and aaahhhed over how long we should hire a room for. We decided on one and a half hours with unlimited drinks. Surely, that should be plenty. Then we would go have ourselves a nice dinner. We were shown to a booth, just the two of us. We ordered jugs of Kirin by the pair over the phone. We weren't sure how to operate the controls, so we asked for assistance. We weren't really sure about it. 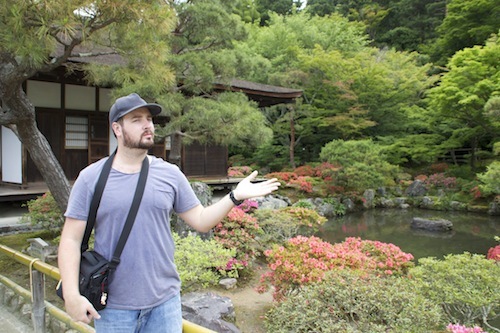 Adam was hoping for a room full of Japanese people to sing with and be entertained by... But here we were in a booth by ourselves. We sang a couple of songs, downed our Kirin. Ordered a couple more, and started singing Disney to each other. And before we knew it, Adam was running down stairs to pay for another hour, and then another. And then possibly another hour. Actually, I'm not sure when we stopped... but we were having so much fun and were raucously drunk. It may have been 3 and a half hours, it may have been 4 and a half. I was keeping up with Adam in the drinking stakes. A mean feat for an ex-beer drinker who was well out of practice! And as you can see in the photo's above - those glasses are huge. There may video evidence of me singing 'Part of Your World' from The Little Mermaid. No. You are not laying your eyes, nor your ears on that footage. The photo above is unflattering enough, thank you very much. Somewhere after 1030pm we managed to prise our fingers from the microphones and stumble back into the streets of Kyoto to find something to eat and catch a bus home ridiculously happy. Our final day in Japan. We visited the Nijō Castle. Built in the early 1600's, the floors were specifically made to sound like nightingales when walked upon. Even the ninja's could be heard if trying to enter the castle! 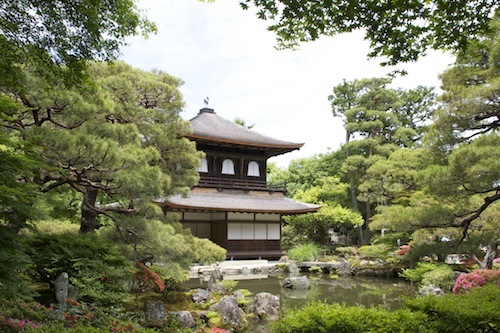 The gardens in Kyoto were beyond spectacular, and I left there with so much inspiration and good intentions to use some of those ideas and concepts in my own garden. Six months on, and I am yet to get there. My garden is currently in an extreme stage of severe neglect, but thats another story, for another day. When wandering from the Castle into the streets surrounding, we happened upon a small second hand and collectibles store. 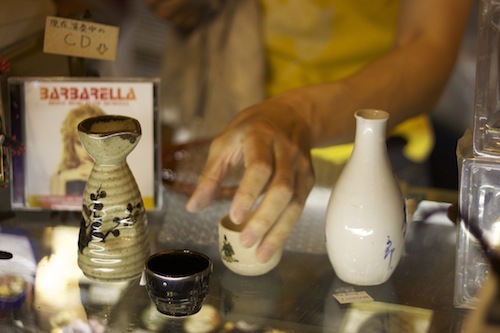 Crammed in there, amongst cartoon figures and Barbarella CD's, was a random bunch of second-hand sake flasks and cups. I currently have an affinity with blue and white, so I picked up a blue and white one to show Adam. He wasn't keen so I sat it back down. Being the good customer I realised I hadn't put it facing the right way. So I picked it back up and re-orientated it, and placed it in it's spot. I didn't realise that I had sat it back down on the lip of a tray, and it promptly toppled over, the neck of it landing on a nearby glass bowl, shattering the end into pieces. I couldn't believe it. I had broken something in a shop. In a second-hand collectibles shop! My automatic reaction was to say "I'm so sorry. I will pay". I was mortified, felt devastated and of course terribly guilty. The shop owner was so sweet, and promised me he could fix it. I wanted to pay and he refused. He mended it as best he could while we continued to look around the store, and I tortured myself about how I could right my wrong. 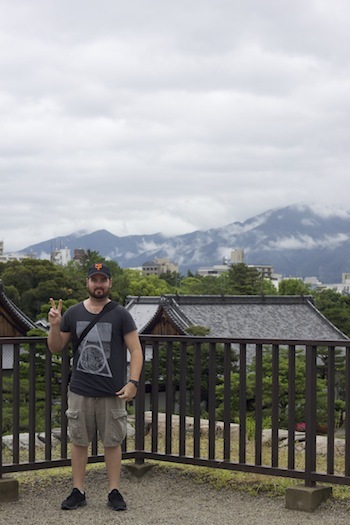 Adam, originally thinking he would be going back to Australia sans sake set, did end up selecting three pieces (pictured above) to create an original set of his very own. And with some persistence, I managed to convince the owner to let me buy the blue and white sake flask (yep, that's it also above) at full price, which quelled my conscience and made me feel worlds better. It now sits at home on my kitchen window sill to be used as a small vase. Though I felt sick to my stomach at the time, I can laugh about it all now. 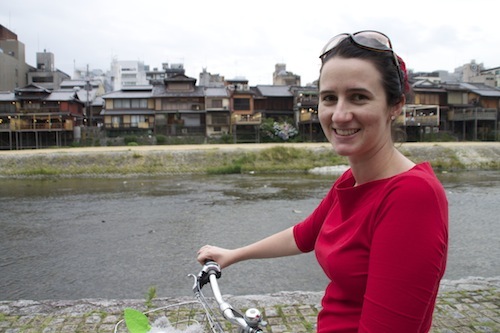 It was then time for us to make our way to the train station, board a train bound for Osaka, followed by a plane back to the Gold Coast where the real world, responsibilities, work and IVF awaited us.